The following list is of known buses both current and those previously operated by Goode's Coaches Pty Ltd - Tumut. Acquired the Adelong - Mount Adrah - Detroit from Smallwood, Adelong between 1979 & 1981. Acquire the Tumut - Adelong - Mount Horeb school contract from A & J Fraser, Adelong 11/85. Acquired the Tumut - Adelong - Wondalga contract from KE McGrath, Tumut with MO 5518 in 1987. Acquired the Tumut - Batlow school & Upper Gilmore Valley feeder contracts from Christian & Holme, Batlow with MO 9626 around-1995. Acquired the Tumut - Lacmalac - Goobagandra, Tumut - Talbingo & Tumut - Tumut Plains - Blowering Dam from TM, RL & TJ Harris, Tumut with MO 1046. MO 2927 & MO 9825. Acquired the Adelong - Allerslie - Yaven Creek school contract from K & J Neyland,Adelong in 1997. Acquired the Tumut - Adelong - Yaven Creek - Mount Adrah (Ellerslie) contract from K & K Neyland, Adelong in 2002. Acquired the Tumut - Tumorrama contract from B & G Krause, Tumut 2/12 with 5080 MO. 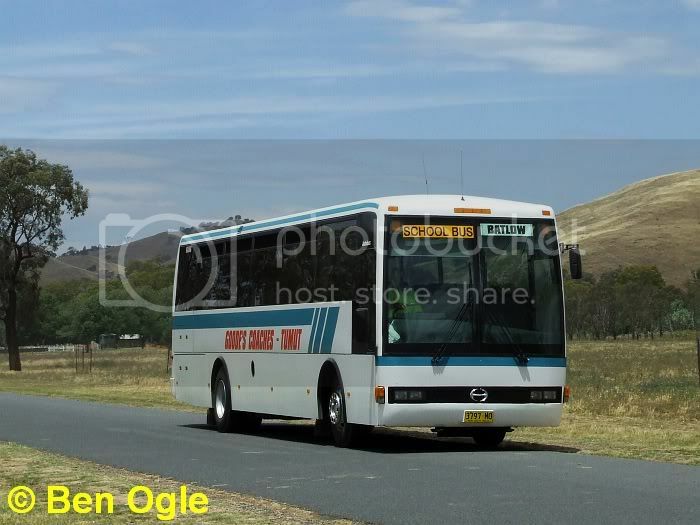 Acquired the Tumut - Gundagai contract from M & L Pigram t/a Gundagai Buses, Gundagai 1/15 with 2707 MO. Australia-wide tours, including outback tours and camping safaris to Central Australia, commenced in 1974. The business from inception was in the name of EJ & BE Goode. By the 1990 Passenger Transport Act (introducing operator accreditation), the company's accreditation (9367) was in the name of E, B, G & A Goode, reflecting ownership by a couple of their children as well. The company traded as EJ & BE Goode and Sons for a period. Goodes Coaches Pty Ltd was registered March 2 1995. Around 8 family members work in the business.